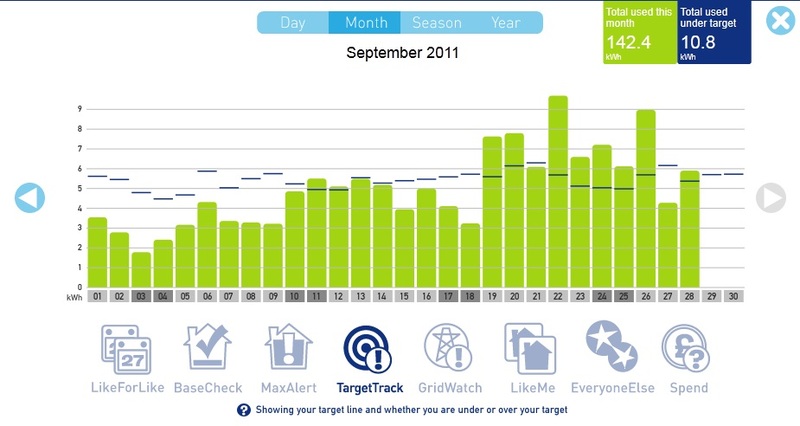 Our electricity usage for September. Can you see when the weather got cold? ... and I like nothing better than a pretty graph. Actually, that's not true. I like many things better than a pretty graph (clear, informative graphs included), but let that not detract from the appeal of seeing my electricity usage displayed graphically. One function the monitor has is to display usage in terms of cost, rather than kWh. By the end of April, I was able to use this function to see that I could expect my bill to drop to £25 per month, which was excellent news as we'd started off paying £35 per month. Imagine my dismay, then, when instead of falling, my bill actually rose slightly, to £38. Surely some mistake? I checked the meter and sure enough, it matched the reading on the bill. Hmm... the meter says our bill should go up but the monitor says it should go down. Something's not right here. The obvious explanation was that the new gadget wasn't working properly. After all, electricity meters are strictly regulated and carefully calibrated, so unlikely to be at fault. On the other hand... I'd been watching the monitor quite closely, as it was a new toy, and it did seem to correspond to appliance useage pretty well. More investigation was needed. I put the two devices next to each other and watched them. Not all the time, you understand (though at times it got close) - I noted down readings and compared useage recorded on the two devices. It soon became obvious that there was a huge discrepancy: The meter was reading about 80% more than the new monitor and still, the monitor seemed plausible. I called Southern Electric to let them know, and they sent me a new monitor. As soon as it arrived (which it did promptly), I connected it up, linked it to the computer, and started monitoring. After a week, I was noting the same discrepancy: The meter reading was 80% higher than the monitor. To get exactly the same discrepancy twice couldn't be a coincidence. I called Southern Electric again, and this is when the fobbing-off started. What browser are you using? Well it was Firefox 4 when this started, but it's Firefox 5 now. Yes, we've had issues with Firefox 4 and 5. That'll be the problem. What?! Oh, you connected it to the computer straight away... you should have left it for seven days before doing that What?!!!!! You'll have to leave it running for a month and only connect it to the computer once in the middle of the month and once at the end. I could see by this time that rational argument was getting me nowhere (and I did try more than What?! ) so I gave in and accepted the additional month of monitoring. By the end of June, I had another month's data and guess what? The meter was still reading 80% higher than the monitor. I called Southern Electric again and explained my belief that the meter was faulty. But the readings aren't particularly high, That's because I don't use very much electricity. The monitor readings are even lower. This proved a real sticking point. Investigations of faulty meters are triggered by unusually high readings. If the readings are in the normal to low range, how could it possibly be reading too high? It's very unlikely that the meter is faulty. I know, but it's also very unlikely that two monitors would under-read to exactly the same extent. We have to choose between two very unlikely things. Eventually that argument proved effective, I refused to complete the questionnaire on typical useage that would loop straight back to Point 1, found out how much it would cost to have a check meter installed if I turned out to be wrong (£31.80, or roughly the amount I'd already overpaid since noticing the fault), and persuaded them to send a man out to install a check meter. A very nice man came to install the check meter in early July, then we had to wait until both meters had clocked 200 units (kilowatt hours). Against all their expectations, this took the best part of two months (I told them it would). For the first week or so of this, I continued to keep a close eye on my three electricity measuring devices. As before, the discrepancy between the old meter and the monitor was 80%, but between the old meter and new check meter, only 50%. The check meter was reading lower than the old meter, but still higher than the monitor. This was most peculiar. I spent some time investigating this, and discovered one circuit in my house that was completely ignored by the monitor... and then got rather bored of the whole thing. When the check meter eventually clocked up its 200 units, I got in touch with Southern Electric again, and they sent a meter reader round to confirm my readings. Fair enough - they can't just take my word for it that the meter's wrong, I might be a complete idiot incapable of reading a meter. The meter reader turned out to be the same very nice man who'd installed the check meter. Let's just bypass the office folk, he said, and installed a nice new meter for me there and then. He also managed to solve the mystery of the ignored circuit - we have some rather peculiar wiring in our house, it turns out. I got a monitor from freecycle, but I haven't rigged it up yet though I am interested in seeing the results. I have been trying to find average usage figures for the UK, but it seems to be harder than it is in the US. Sharon Astyks 'Riot for Austerity' aim of 10% of the national average made me wonder what we use and how, and how we can reduce it, but either I'm looking in the wrong places or it's hard to find!